High cholesterol and blood pressure: How far are they connected? What’s behind the high cholesterol and blood pressure link? 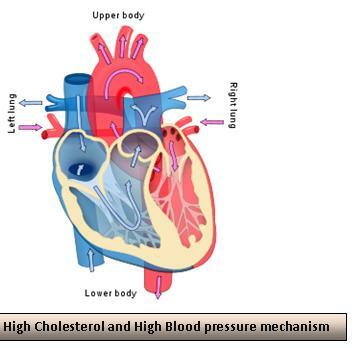 How far high cholesterol may influence high blood pressure? What precautions should I consider? Fact: High cholesterol and high blood pressure are two main risk factors of heart diseases, and are the major leading causes for heart disease in USA. In fact, more the thirty million Americans suffer from both diseases. 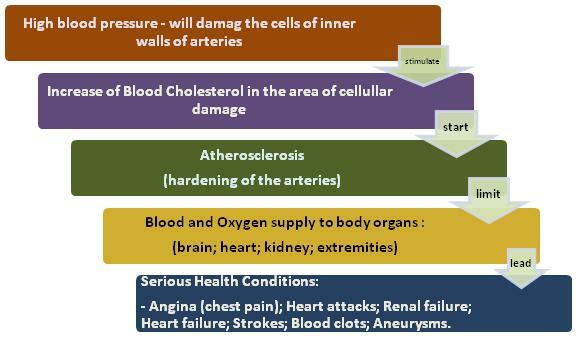 How does high cholesterol cause high blood pressure? What’s the mechanism? Your heart is the natural pump which contracts to push the blood throughout your entire body into arteries and blood capillaries. Your blood pressure is the force done by your heart to pump the blood inside your arteries. Usually, high blood pressure or hypertension increases your risk for cardiovascular diseases, strokes, renal problems, and dementia. Normally, cholesterol circulates in our blood stream, but when amount of cholesterol increases in your blood (Hypercholesterolemia), excess amounts of LDL or bad cholesterol will build up on the walls of your arteries gradually. Eventually, your arteries will become narrower; this will disturb normal blood flow. Now, your heart will have to pump the blood more forcibly to help blood to pass through your narrowed arteries. Due to strong pumping action of the heart, your blood will move more rapidly exerting more pressure on the walls of your arteries; this condition is known as Hypertension or high blood pressure. Prevention can really make a difference, besides it is easy. You must adopt new lifestyle changes, like eating diet low in cholesterol, saturated fats and sodium (salt). Lose excess kilograms from your weight, and add some physical activity to your daily life. But if you already suffer from hypertension and hypercholesterolemia, you doctor will prescribe a class of drugs known as statins. Statins are known to decrease the level of both: your cholesterol and your blood pressure at the same time with the cost of some side effects. If you work closely with your doctor, you will be able to control both high blood and high cholesterol and live happily ever after. You have enough willing to change your figures and live healthy. Good luck! Get some more tips on how to fight High Cholesterol Problems beside the High Cholesterol and Blood Pressure precautions.